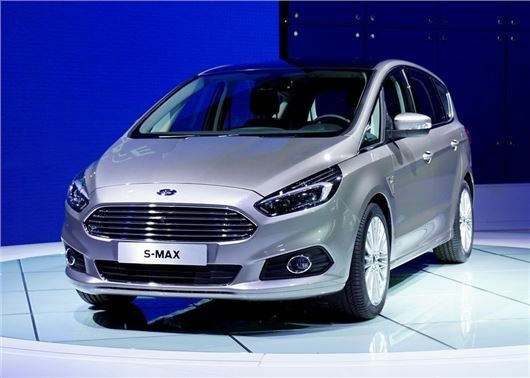 The second-generation Ford S-MAX will cost £24,545 when it arrives in UK showrooms this summer. The seven-seater MPV gets new engines, improved economy and the option of four-wheel drive. The same size as the outgoing model, the S-MAX cabin will feature seven-seats as standard, with individual powered folding available for all of the seats in the second and third row. Road noise has been reduced and passengers in the rear will be able to select their own climate settings. Ford also says interior comfort has been enhanced, with multi-contour seating that will improve back and upper leg support. Retaining its flexible and sporty appeal, the new Ford S-MAX is offered with a new range of petrol and diesel engines, with the highlight being the bi-turbo 2.0-litre TDCi engine with 210PS and 450Nm of torque from just 2000rpm. No economy or performance figures have been made public yet, but expect the new bi-turbo to cover 0-62mph in sub-seven seconds and be linked to a six-speed PowerShift automatic gearbox. Ford has also improved the 2.0-litre TDCi diesel engine, available with 120PS, 150PS and 180PS. All 2.0 TDCi models will return a claimed 56.5mpg and emit 129g/km CO2 and the 150PS and 180PS engines will get the option of four-wheel drive for the first time ever in the S-MAX. The petrol powerplants will include the 160PS 1.5-litre EcoBoost with a five-speed manual 'box and the range-topping 240PS 2.0-litre EcoBoost with a six-speed automatic transmission. Again, there are no details on economy or performance as yet. The new S-MAX will be one of the most advanced models to emerge from Ford, with no less than 20 new technologies offered. As a result, the S-MAX can be specified with LED headlights, traffic sign recognition, autonomous braking and an intelligent speed limiter that will automatically adjust the vehicle's speed to prevent the driver from braking road limits. The S-MAX will also be able to detect and steer automatically into spaces alongside other cars in the same way that Ford's park assist helps drivers to parallel park. Ford has made significant improvements to handling and steering, with the inclusion of adaptive steering, which automatically adjusts the steering ratio to match the vehicle's speed. Turning out of tight junctions should also be easier, with an optional front camera that will display 180 degree right and left view on the car's eight-inch screen to help minimise blind spots.